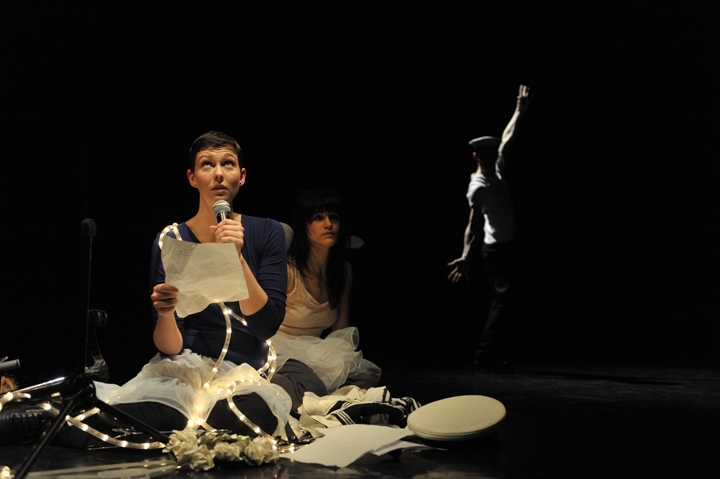 Candoco Dance Company: Three Acts of a Play, Laban Theatre, October 17. Programming is everything in a triple bill; it can be an uneasy alliance of repertoire and new work, an indigestible three-course meal, or it can be like three acts of a play, an analogy Candoco Dance Company adopted for its most recent triple bill. 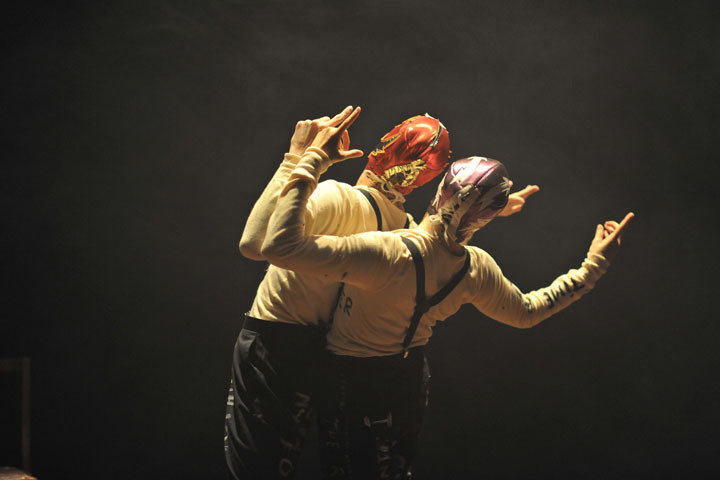 Two of the acts are welcome re-stagings — Trisha Brown’s Set Reset/Reset and Wendy Houstoun’s Imperfect Storm — and the third is a new duet for Mirjam Gurtner and Dan Daw, Studies for C, by Javier de Frutos. I saw Set and Reset/Reset last year in the company’s Turning Twenty program and thought it suited the company beautifully. It still does. Robert Rauschenberg’s design floats above the stage, though it seems there is a little less floating than before. 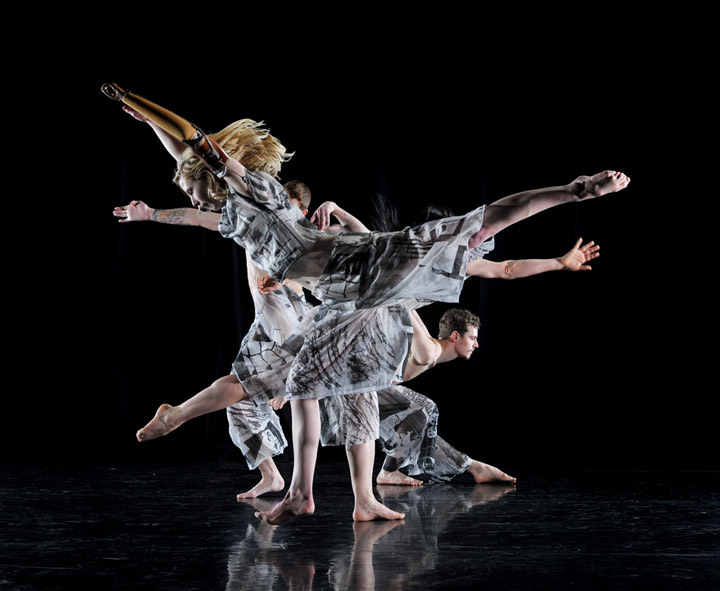 Even though there is a structure to the choreography, the dancers seem to walk or run on as the spirit takes them, joining in Laurie Anderson’s musical procession that strolls down the west coast of California with its bells, assorted sirens and vocal improvisations in a spirit of carefree timelessness. There is a seductive dynamic of improvisation in the dance, too, a freedom of movement in which the dancers bump into each other and ricochet off each other with singular unconcern. The wings are of diaphanous material so we see what is going on off stage as well as on, a spatial continuum that Brown clearly enjoys and which is enhanced by Chahine Yavroyan’s lighting. The dancers are quite at ease, partly because the choreography is at ease and partly because the dancers have contributed to some of the choreography in the creative re-setting process. ‘Go with the flow’ seems to be the philosophical underpinning of the work, with its random connections, playful exits and entrances and a lightness that comes from Brown’s joy in exploring the air. As might be expected, there is no purposeful ending; the music fades away into the distance and the dance continues until we can no longer see it. Studies for C is pure magic. The setting suggests a domestic hearth with a carpet and two chairs, drawn in to an intimate space by de Frutos’ own lighting and haze, but the context suggests a wrestling ring with Daw and Gurtner fully masked and wearing leather jackets covered in painted phrases like ‘Better to Die’, and ‘The violets in the mountains have broken the rocks’. The inspiration is more Tennessee Williams’ Camino Real than Becket’s Waiting for Godot, but the songs by Lila Downs take us definitively to Mexico. In this rich juxtaposition of influences, Daw and Gurtner converse or argue with mute passion in their carpeted ring, giving a rich reading of the characters. The effect of the masks pushes the physical element to a stifling pitch of psychological intensity. Gurtner is mad, and flies across the floor. Daw is upset and stands truculently with his hands on hips. They are a couple that feels trapped by their familiarity, and struggles in vain to break free. The masks add an insectile quality to the characters and the inclusion of the song of La Cucaracha suggests two cucarachas down on their luck going through their death throes, legs in the air, trembling on the edge of extinction. They crawl over each other, Daw pulling at Gurtner’s mask. She kicks him, he howls and after a semblance of compassionate support, the two retreat to their respective corners to the lament, Yunu Yucu Ninu. Gurtner starts to take off her mask as the lights go down. Will she break free? We never see her face. Annie Hanauer takes the microphone at the beginning of Wendy Houstoun’s Imperfect Storm, surrounded by her group of actors. ‘Tonight we were going to do The Tempest, by Shakespeare. William Shakespeare. But we found it a little wordy.’ Deciding to act it without the text, the only way to get people on and off the stage is to use the stage directions, she explains, and to use lighting (by Chahine Yavroyan) to create a series of tableaux, like paintings layered with costumes. Enter Alonso, Sebastian, Antonio; enter Ferdinand and Gonzalo; enter Prospero; enter Boatswain. Miranda’s already at the microphone. John Avery created just the right music, and Nicola Fitchett found just the right ruffs, hats and other assorted costumes and props. Each character picks a vestige of costume from the overturned costume rack. Sound of storm and lashing rain. Daw puts on his Boatswain’s hat, while others are quaking from the storm, pitched and tossed across the stage. Alonso pulls in a string of lights and drapes then around the shipwrecked group. Victoria Malin begins to recite snatches of Prospero’s lines, which devolve into a commentary on the progress of the play (‘we got trapped in this corner…by lighting’) as three characters fight with two wooden swords and a coat hanger. Malin continues with a brilliant monologue on the courage to stay… while all the characters leave. She then describes the stages of a storm that Daw illustrates in an extended solo, dancing in the spotlight. It is wonderful, from feeling the wind in his face (stage 1) to leaves rustling (stage 2) to whole trees in motion (stage 5) and widespread structural damage (stage 7) by which time Daw is running around in a circle jumping and flapping his arms. Alonso and Miranda enter and Daw is carried off, exhausted. For all its apparent chaos, Imperfect Storm is a sophisticated work with beautiful writing (Houstoun takes sophistication and writing to another level in her 50 Acts). Houstoun allows the dancers to be themselves on stage while playing a failed amateur drama group without hamming it up. What comes across is a work that seems built up from an acute observation of what the dancers can do, and with their creative cooperation: a work that is not imposed on them, but grows out of them. And as she continues to muse, the lights go suddenly and convincingly to blackout.